I think you'll love these creamy refreshing popsicles which are only 4 ingredients and will keep you cool this summer! Since blackberries are in season now you should be able to find ones that are sweet. The greek yogurt make these popsicles nice and creamy without the guilt. This recipe can also be made with honey or a little bourbon for a kick. Mix the yogurt, sugar, and lemon. 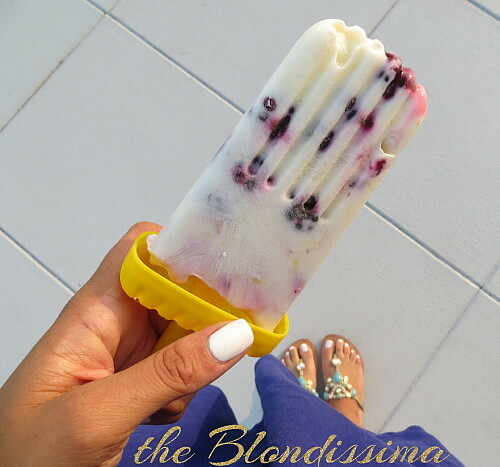 Pour the mixture into the popsicle molds a little at a time so you can layer blackberries in between. Check to make sure there are no air gaps, then freeze for 6 hours or overnight. You can find more of my popsicle recipes here. Mmmm those sound delish and I think I could even get mini-me to eat them!